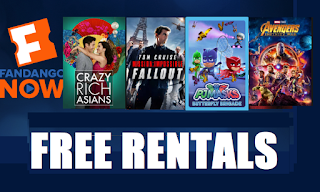 Free $6 FandangoNow Online Movie Credit = Free Movie Rental! Free $6 FandangoNow Online Movie Credit = Free Movie Rental! They have tons of great movies to rent for just $2.99 that would be free with this credit. Watch on your computer or streaming to your phones, tablets or TVs. HURRY AND ADD THE $6 CODE TO YOUR ACCOUNT NOW AND THEN YOU CAN USE IT ANYTIME YOU WANT AT A LATER DATE.